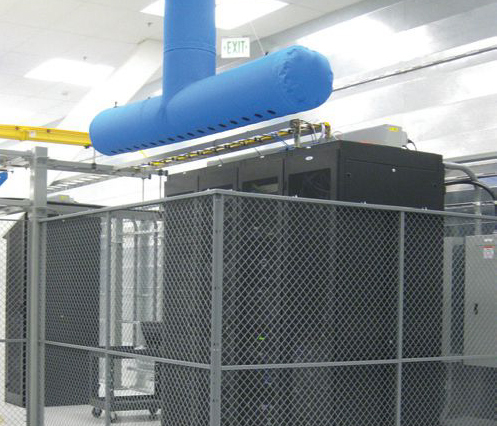 Cooling build-outs can be one of the highest operational costs facing data storage facilities. However, executives at San Diego-based redIT says it has implemented a new cost saving measure at its data centres. The new procedure involves adding fabric duct cooling drops for individual partitions inexpensively, and only as new customers come onboard. alternative by installing each sheet metal drop and diffuser only after a customer comes onboard. This approach postpones construction costs while saving data centres time and resources. That said, this phased sheet metal construction approach also has disadvantages. Sheetmetal construction creates airborne particulates and poses other unnecessary risks to neighbouring computer equipment. It also costs thousands of dollars in installation labor and material associated with each new cooling drop. Additionally, outsourced sheet metal contractors in highly restricted access control areas can potentially jeopardize security efforts. redIT, operating multi-tenant facilities with many Fortune 500 clients, realized these challenges. Furthermore, the firm wasn’t satisfied with the prices, performance, or flexibility of conventional CRAC air distribution systems. redIT used this cost-saving phased cooling approach during the build-out of the first 14,800-sq-ft data centre phase of its 88,000-sqft facility in San Diego. The HVAC service contractor, Countywide Mechanical Systems, introduced fabric ductwork to redIT’s design team. For additional information please contact your nearest ecoHVAC representative, visit www.ecohvac.com.au/fabric-duct.htm.